Application of this thermometer is straightforward, typically requiring analysis of only one phase (quartz). This can be accomplished either by EPMA for crystallization temperatures above 600°C, or by SIMS for temperatures down to at least 400°. Resulting temperature estimates are very precise (usually better than ±5°C), potentially allowing detailed characterization of thermal histories within individual quartz grains. Although calibrated for quartz crystallized in the presence of rutile, the thermometer can also be applied to rutile-absent systems if TiO2 activity is constrained. We are grateful to several persons for assistance at various stages of this project. 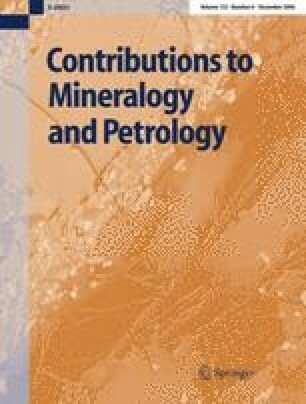 Frank Spear is thanked for insightful discussions of Ti behavior in metamorphic rocks, for addressing the issue of Ti activity in rutile-undersaturated magmas, and for providing natural samples for analysis. Jay Thomas, Joe Pyle, and Leslie Hayden each participated in trips to Woods Hole Oceanographic Institute for ion microprobe sessions. There, Graham Layne and Nobu Shimuzu each provided valuable assistance. For samples—only some of which are mentioned in this paper—we acknowledge Jay Ague, Fred Anderson, Eric Christiansen, John Farver, Wes Hildreth, Marian Lupulesku, and Mark Reed. Mark Schmitz and an anonymous reviewer provided useful comments. This work was supported by the U.S. National Science Foundation, awards EAR−0409622 and EAR-440228.